[ACT](VC): Legion 20000 "Combined Strength Seeker, Locrinus" (If your opponent's vanguard is grade 3 or greater, this unit may return four cards from your drop zone into your deck once, search your deck for the specified card, and Legion) [AUTO](VC):[Counter Blast (1)-card with "Seeker" in its card name] When this unit attacks a vanguard, if this unit is Legion, you may pay the cost. If you do, choose up to four units in your front row with "Seeker" in its card name, and those units get [Power]+3000 until end of turn. [AUTO](VC):[Counter Blast (1)-card with "Seeker" in its card name] When this unit is placed on (VC), you may pay the cost. If you do, search your deck for up to one card named "Combined Strength Seeker, Locrinus", call it to (RC), and shuffle your deck. It's CRUNCH MONTH, as this November features a ton of unique cards in Fighter's Collection 2014 AND 2 Extra Boosters, so hopefully expect no clones for the next several weeks to come. Hooray! And starting us off is the first Legion unit (or Leg-Eon as Japan call it because Bushiroad cannot English) for Royal Paladins, Brutus. This is a fairly good instance of power creep, since now 3 positive skills on one unit is going to be considered normal. So let's work our way down one at a time. First is the skill to initiate Lower Limb-Age. When both players are Grade 3, this ACT skill can shuffle 4 cards exactly in your drop zone to your deck, search for the card specified (in this case Combined Strength Seeker, Locrinus) , then place it next to your Vanguard in the VG circle. But this skill's only good once per card per game. Both are treated as Vanguards, but only the main one which initiated Prop-Era can be attacked. And only the main VG's Critical counts, but it will treat the hit as both units hitting the Vanguard. Man, that's a lot of text to explain Support Appendage-Indefinite Period Of Time to newbies. So as a mechanic, what can it do for us? Well, Mid Game, it gives you some nice way to ensure a Vanguard hit with high power and makes it constant for the rest of the game, but as I've said before Mid Game no-one guards the Vanguard, and Late Game people have been dropping PGs for Limit Break units that gain power since forever, so mechanically the only difference is the novelty; it's something we've all seen before and should no how to deal with. So what's the end result? Well, once he's actually paired up with his Mate (INNUENDO GO) and he attacks, you Counterblast 1 to give 4 front row Seeker units 3k until the end of turn. So basically himself, his mate, and both front-row rearguards. Okay, so his column is gaining an extra forced 5k guard assuming no PGs (which is something you assume almost NEVER) and ensure 21k columns if yours was originally 18k+. Meh, columns games aren't anything to particularly worry about; there's better aggro options out there. However, since Legion is FINALLY not restricted to Late Game, you could turn this into a nice way to squeeze in some extra damage from the powered-up rear-guards. So thankfully, this is probably the last time I have to go through such a rigorous finger exercise. But long story short, he's okay, but lacks the punch to consistently drive the opponent to the floor compared to more aggro options. Being less restricted in terms of when he happens helps massively though. Welcome to our early preview of Fighter's Collection 2014 that comes out in a couple of weeks. Seeing as November has Fighter's Collection, three trial decks and two extra boosters coming out, that's a LOT of cards to review in one month, so we might as well get an early start on it. Plus Saikyo was threatening to stab my kitty if we didn't start reviewing stuff that was coming out in November. I don't even own a kitty. Things got a bit weird and, well, we don't talk about what happened next. And we reviewed most everything in set 15. So, anyway, this week we're covering the five cards from Fighter's Collection 2014 that are wanted by a lot of people, but aren't easy to get. At least in Japan, because Bushiroad sometimes makes it easier for the English version to get some cards, looking at you, Glendios. Anyway, what we have here is a card that introduces everyone to the new mechanic coming out of Block 4, Legion. What is Legion? Well, basically, you have two units in the Vanguard circle. You combine their power when on the attack. When you attack in Legion, only the Grade 3 Legion's, not the Mate (generally a Grade 2 that's on the left side of the Legion) critical and twin drive applies when attacking. When on defense, the Legion's power is only the power of the Grade 3 Legion, not the mate. To put it in simpler terms, just think of a Legion as a way for a Vanguard to have two units boosting the attack. It should be noted that if something has an effect like "3 or more in the front row", when you're in Legion, you have 2 in the front row already. And, certain cards, like Cat Butler and Miss Mist, will work with and against Legions, since you, with most Legions, have a Grade 2 as well as a Grade 3 unit in the Vanguard circle. 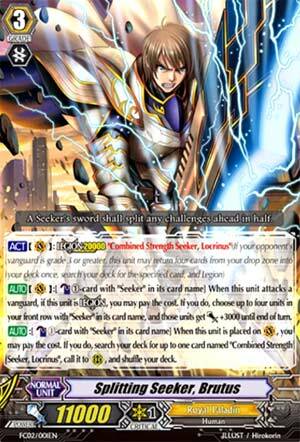 Any unit that needs a specific card in the Vanguard circle, like say Bedivere, Kay or Wingal Brave and how they need a "Blaster" unit in the Vanguard circle... Well, if you had a Legion of (for example) Soul Saver Dragon and Blaster Blade, all three would, in fact, work, because you have a Blaster in its name in the Vanguard circle. When you boost a Legion, you get to choose which unit you're boosting, because some cards need to boost specific units. So, with that example of Soul Saver and Blaster Blade, you could use Wingal Brave to boost Blaster Blade and search out a unit with Blaster in its name and add it to your hand when the attack hits. More information can be found at the wiki or on Pojo's forums if you need more answered. Now, Legions generally come in two ways, which I shall refer to as Type 1 and Type 2 Legions. Type 1 Legions are Legions that only work for the turn that you Legion, and generally only upon Legioning. Afterwords, they have no skills and are just a beat stick. Generally speaking, Type 1 Legions are either free or low-cost with their skills, making up for the fact that they only work once/for that turn only. Type 2 Legions are Legions that can work turn after turn. The cost of using these skills is, generally, proportionate to how strong the effect is. There are Legions that don't fall into either Type 1 or Type 2, but we'll cover them as they come up. Generally, they're vanilla legions that only swing for big numbers but have no skills. There's one more thing before I continue to Brutus here. Nearly all Legions have a non-Legion skill that will work when they're not in Legion. Most of the time, it's a simple increase in attack power, so, just keep that in mind. Okay, now that all the preliminaries are out of the way, let's look at Brutus, shall we? The first thing that I need to point out is that cards no longer have the Lord effect, the -2000 if you have another unit of another clan in play, or the -2000 if you don't have another unit of the clan in play negative effects. He's part of a new Royal Paladin sub-clan called Seekers. If you want to know the lore, well, they're from the distant past because Link Joker somehow wiped out Blaster Blade Liberator and the other Liberators from the timeline. Remember how Maelstrom Reverse was from an alternate future? Well, that becomes important, because the Block 4 sub-clans are from all across different points of time and space. When he's placed on the Vanguard circle, you can Especial Counterblast 1 to superior call out his mate to the rear guard circle. We'll cover what Locrinus does tomorrow. And his Legion skill is, when this unit attacks, you can Especial Counterblast 1 to give up to four front-line Seekers an extra 3000 power each. Yes, up to four Seekers. Which means, when Brutus and Locrinus attacks, the base attack, not counting any other boosters, is most likely going to be 26000, not 20000, a 6000 booster makes the attack 32000, which gets into the whole "perfect guard or no guard" territory. Any other attackers, like 12K, 10K, vanilla 10K attackers also get this boost. In short, the playstyle Brutus promotes is one that Royal Paladins have done for a long time now. Search specific cards, power up your units to really high attack levels, and smash through your opponent's defenses in one shot. So, I like this guy, a lot. Personally, I know a lot of people are looking forward to what's coming in Set 16, but this is a unit that I'm going to enjoy when I start playing Seekers.